RD Sharma Solutions for Class 8 Math Chapter 18 Practical Geometry (constructions) are provided here with simple step-by-step explanations. These solutions for Practical Geometry (constructions) are extremely popular among class 8 students for Math Practical Geometry (constructions) Solutions come handy for quickly completing your homework and preparing for exams. All questions and answers from the RD Sharma Book of class 8 Math Chapter 18 are provided here for you for free. You will also love the ad-free experience on Meritnation’s RD Sharma Solutions. All RD Sharma Solutions for class 8 Math are prepared by experts and are 100% accurate. Construct a quadrilateral ABCD, in which AB = 6 cm, BC = 4 cm, CD = 4 cm, ∠B = 95° and ∠C = 90°. Steps of construction:Step I: Draw BC=4 cm.Step II: Construct ∠ABC=95° at B.Step III : With B as the centre and radius 6 cm, cut off BA=6 cm.Step IV: Construct ∠BCD=90° at C. Step V :With C as the centre and radius 4 cm, cut off BA=4 cm.Step VI: Join CD.The quadrilateral so obtained is the required quadrilateral. Construct a quadrilateral ABCD, where AB = 4.2 cm, BC = 3.6 cm, CD = 4.8 cm, ∠B = 30° and ∠C = 150°. Steps of construction:Step I: Draw BC=3.6 cm.Step II: Construct ∠ABC=30° at B.Step III : With B as the centre and radius 4.2 cm, cut off BA=4.2 cm.Step IV: Construct ∠BCD=150° at C.Step V :With C as the centre and radius 4.8 cm, cut off CD=4.8 cm.Step VI: Join AD.The quadrilateral so obtained is the required quadrilateral. Construct a quadrilateral PQRS, in which PQ = 3.5 cm, QR = 2.5 cm, RS = 4.1 cm, ∠Q = 75° and ∠R = 120°. Steps of construction:Step I: Draw QR=2.5 cm.Step II: Construct ∠PQR=75° at Q.Step III : With Q as the centre and radius 3.5 cm, cut off QP=3.5 cm.Step IV: Construct ∠QRS=120° at R.Step V :With R as the centre and radius 4.1 cm, cut off RS=4.1 cm.Step VI: Join PSThe quadrilateral so obtained is the required quadrilateral. Construct a quadrilateral ABCD given BC = 6.6 cm, CD = 4.4 cm, AD = 5.6 cm and ∠D = 100° and ∠C = 95°. Steps of construction:Step I: Draw DC=4.4 cm.Step II: Construct ∠ADC=100° at D.Step III : With D as the centre and radius 5.6 cm, cut off DA=5.6 cm.Step IV: Construct ∠BCD=95° at C. Step V :With C as the centre and radius 6.6 cm, cut off CB=6.6 cm.Step VI: Join AB.The quadrilateral so obtained is the required quadrilateral. Construct a quadrilateral ABCD, in which AD = 3.5 cm, AB = 4.4 cm, BC = 4.7 cm, ∠A = 125° and ∠B = 120°. Steps of construction:Step I: Draw AB=4.4 cm.Step II: Construct ∠BAD=125° at A.Step III : With A as the centre and radius 3.5 cm, cut off AD=3.5 cm.Step IV: Construct ∠ABC=120° at B.Step V :With B as the centre and radius 4.7 cm, cut off BC=4.7 cm.Step VI: Join CD.The quadrilateral so obtained is the required quadrilateral. 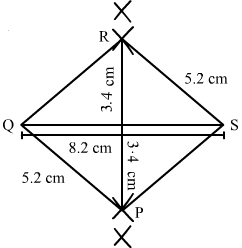 Construct a quadrilateral PQRS, in which ∠Q = 45°, ∠R = 90°, QR = 5 cm, PQ = 9 cm and Rs = 7 cm. Steps of construction:Step I: Draw QR=5 cm.Step II: Construct ∠PQR=45° at Q.Step III : With Q as the centre and radius 9 cm, cut off QP=9 cm.Step IV: Construct ∠QRS=90° at R. Step V :With R as the centre and radius 7 cm, cut off RS=7 cm.Since, the line segment PQ and RS intersect each other, the quadrilateral cannot be constructed. Construct a quadrilateral ABCD, in which AB = BC = 3 cm, AD = 5 cm, ∠A = 90° and ∠B = 105°. Steps of construction:Step I: Draw AB=3 cm.Step II: Construct ∠DAB=90° at A.Step III : With A as the centre and radius 5 cm, cut off AD=5 cm.Step IV: Construct ∠ABC=105° at B.Step V: With B as the centre and radius 3 cm, cut off BC=3 cm.Step VI: Join CD.The quadrilateral so obtained is the required quadrilateral. Construct a quadrilateral BDEF, where DE = 4.5 cm, EF = 3.5 cm, FB = 6.5 cm, ∠F = 50° and ∠E = 100°. Steps of construction:Step I: Draw EF=3.5 cm.Step II: Construct ∠DEF=100° at E.Step III : With E as the centre and radius 4.5 cm, cut off DE=4.5 cm.Step IV: Construct ∠EFB=50° at F.Step V :With F as the centre and radius 6.5 cm, cut off FB=6.5 cm.Step VI: Join BD.The quadrilateral so obtained is the required quadrilateral. Construct a quadrilateral ABCD given that AB = 4 cm, BC = 3 cm, ∠A = 75°, ∠B = 80° and ∠C = 120°. Steps of construction:Step I: Draw AB=4 cm.Step II: Construct ∠XAB=75° at A and ∠ABY=80° at B.Step III: With B as the centre and radius 3 cm, cut off BC=3 cm.Step IV: At C, draw ∠BCZ=120° such that it meets AX at D. The quadrilateral so obtained is the required quadrilateral. Construct a quadrilateral ABCD, where AB = 5.5 cm, BC = 3.7 cm, ∠A = 60°, ∠B = 105° and ∠D = 90°. We know that the sum of all the angles in a quadrilateral is 360.i.e., ∠A+∠B+∠C+∠D=360°⇒∠C=105°Steps of construction:Step I: Draw AB=5.5 cm.Step II: Construct ∠XAB=60° at A and ∠ABY=105°.Step III: With B as the centre and radius 3.7 cm, cut off BC=3.7 cm.Step IV: At C, draw ∠BCZ=105° such that it meets AX at D.The quadrilateral so obtained is the required quadrilateral. Construct a quadrilateral PQRS, where PQ = 3.5 cm, QR = 6.5 cm, ∠P = ∠R = 105° and ∠S = 75°. We know that the sum of all the angles in a quadrilateral is 360.i.e., ∠P+∠Q+∠R+∠S=360°⇒∠Q=75°Steps of construction:Step I: Draw PQ=3.5 cm.Step II: Construct ∠XPQ=105° at P and ∠PQY=75° at Q.Step III: With Q as the centre and radius 6.5 cm, cut off QR=6.5Step IV: At R, draw ∠QRZ=105° such that it meets PX at S.The quadrilateral so obtained is the required quadrilateral. Construct a quadrilateral ABCD when BC = 5.5 cm, CD = 4.1 cm, ∠A = 70°, ∠B = 110° and ∠D = 85°. We know that the sum of all the angles in a quadrilateral is 360.i.e., ∠A+∠B+∠C+∠D=360°⇒∠C=95°Steps of construction:Step I: Draw BC=5.5 cm.Step II: Construct ∠XBC=110° at A and ∠BCY=95°.Step III: With C as the centre and radius 4.1 cm, cut off CD=4.1 cm.Step IV: At D, draw ∠CDZ=85° such that it meets BY at A.The quadrilateral so obtained is the required quadrilateral. Construct a quadrilateral ABCD, where ∠A = 65°, ∠B = 105°, ∠C = 75° BC = 5.7 cm and CD = 6.8 cm. We know that the sum of all the angles in a quadrilateral is 360.i.e., ∠A+∠B+∠C+∠D=360°⇒∠D=115°Steps of Construction:Step I: Draw BC=5.7 cm.Step II: Construct ∠XBC=105° at B and ∠BCY=105° at C.Step III : With C as the centre and radius 6.8 cm, cut off CD=6.8 cm.Step IV: At D, draw ∠CDZ=115° such that it meets BY at A. The quadrilateral so obtained is the required quadrilateral. Construct a quadrilateral PQRS, in which PQ = 4 cm, QR = 5 cm, ∠P = 50°, ∠Q = 110° and ∠R = 70°. Steps of construction:Step I: Draw PQ=4 cm.Step II: Construct ∠XPQ=50° at P and ∠PQY=110° at Q.Step III : With Q as the centre and radius 5 cm, cut off QR=5 cm.Step IV: At R, draw ∠QRZ=70° such that it meets PX at S. The quadrilateral so obtained is the required quadrilateral. Construct a quadrilateral ABCD in which AB = 4.4 cm, BC = 4 cm, CD = 6.4 cm, DA = 3.8 cm and BD = 6.6 cm. First, we draw a rough sketch of the quadrilateral ABCD and write down its dimensions along the sides.We may divide the quadrilateral into two constructible triangles ABD and BCD.Steps of Construction:Step I: Draw BD=6.6 cmStep II: With B as the centre and radius BC=4 cm, draw an arc.Step III: With D as the centre and radius 6.4 cm, draw an arc to intersect the arc drawn in Step II at C.Step IV: With B as the centre and radius 4.4 cm, draw an arc on the side BD opposite to that of C.Step V: With D as the centre and radius 3.8 cm, draw an arc to intersect the arc drawn in Step IV at A.Step VI: Join BA, DA, BC and CDThe quadrilateral ABCD so obtained is the required quadrilateral. Construct a quadrilateral ABCD such that AB = BC = 5.5 cm, CD = 4 cm, DA = 6.3 cm and AC = 9.4 cm. Measure BD. Steps of construction:Step I: Draw AB=5.5 cmStep II: With B as the centre and radius BC=5.5 cm, draw an arc.Step III: With A as the centre and radius AC=9.4 cm, draw an arc to intersect the arc drawn in Step II at C.Step IV: With C as the centre and radius CD=4 cm, draw an arc.Step V: With A as the centre and radius AD=6.3 cm, draw an arc to intersect the arc drawn in Step IV at D.Step VI: Join DA, BC, AC and CD.The quadrilateral ABCD so obtained is the required quadrilateral. Construct a quadrilateral XYZW in which XY = 5 cm, YZ = 6 cm, ZW = 7 cm, WX = 3 cm and XZ = 9 cm. Steps of construction:Step I: Draw XZ=9 cmStep II: With X as the centre and radius 5 cm, draw an arc above XZ.Step III: With Z as the centre and radius 6 cm, draw an arc to intersect the arc drawn in Step II at Y above XZ.Step IV: With Z as the centre and radius 7 cm, draw an arc below XZ.Step V: With X as the centre and radius 3 cm, draw an arc to intersect the arc drawn in Step IV at W below XZ.Step VI: Join XY, YZ, ZW and XW.The quadrilateral WXYZ so obtained is the required quadrilateral. Construct a parallelogram PQRS such that PQ = 5.2 cm, PR = 6.8 cm and QS = 8.2 cm. In a parallelogram opposite sides are equal. Thus, we have to construct a quadrilateral PQRS in whichPQ=5.2 cm, PR=6.8 cm and QS=8.2 cm.Steps of construction:Step I: Draw QS=8.2 cmStep II: With Q as the centre and radius 5.2 cm, draw an arc.Step III: With S as the centre and radius 5.2 cm, draw an arc to intersect the arc drawn in Step II at C.Step IV: With P as the centre and radius 6.8 cm.Step V: With Q as the centre and radius 5.2 cm, draw an arc to intersect the arc drawn in Step IV at A.Step VI: Join QR, QP, PS and SR.The quadrilateral PQRS so obtained is the required quadrilateral. Construct a rhombus with side 6 cm and one diagonal 8 cm. Measure the other diagonal. Steps of construction:Step 1: Draw AC=8 cm.Step 2: With A as the centre and radius=6 cm, draw arcs on both sides.Step 3: With C as the centre and radius=6 cm, draw arcs on both sides, intersecting the previous arcs at points B and D.Step 4: Join BD =8.9cm.Thus, ABCD is the required rhombus. Construct a kite ABCD in which AB = 4 cm, BC = 4.9 cm and AC = 7.2 cm. Steps of construction:Step I: Draw AC=7.2 cm.Step II: With A as the centre and radius 4cm, draw arcs on both sides of the line segment AC.Step III : With C as the centre and radius 4.9 cm, draw arcs on both sides of AC intersecting the previous arcs of step II at B and D.Step IV: Join BA, DA, BC and CD. Thus, the quadrilateral ABCD so obtained is the required kite. Construct, if possible, a quadrilateral ABCD given AB = 6 cm, BC = 3.7 cm, CD = 5.7 cm, AD = 5.5 cm and BD = 6.1 cm. Give reasons for not being able to construct it, if you cannot. Steps of construction:Step I: Draw AB=6 cm.Step II: With A as the centre and radius 5.5 cm, draw an arc.Step III : With B as the centre and radius 6.1 cm, draw an arc to intersect the arc drawn in StepII at D.Step IV: With B as the centre and radius 3.7 cm, draw an arc on the side.Step V :With D as the centre and radius 5.7 cm, draw an arc to intersect the arc drawn in StepIV at C.Step VI: Join BD, DA, BC and CD. The quadrilateral ABCD so obtained is the required quadrilateral. Construct, if possible, a quadrilateral ABCD in which AB = 6 cm, BC = 7 cm, CD = 3 cm, AD = 5.5 cm and AC = 11 cm. Give reasons for not being able to construct, if you cannot. (Not possible, because in triangle ACD, AD + CD < AC). i.e., AD + CD < AC, which is not possible. So, the construction is not possible. Construct a quadrilateral ABCD in which AB = 3.8 cm, BC = 3.0 cm, AD = 2.3 cm, AC = 4.5 cm and BD = 3.8 cm. Steps of construction:Step I: Draw AC=6 cm.Step II: With A as the centre and radius 3.8 cm, draw an arc.Step III : With C as the centre and radius 3.0 cm, draw an arc to intersect the arc drawn in Step II at B.Step IV: With B as the centre and radius 3.8 cm, draw an arc on the other side of AC. Step V :With A as the centre and radius 2.3 cm, draw an arc to intersect the arc drawn in Step IV at D.Step VI: Join BA, DA, BC and CD to obtained the required quadrilateral. Construct a quadrilateral ABCD in which BC = 7.5 cm, AC = AD = 6 cm, CD = 5 cm and BD = 10 cm. Steps of construction:Step I: Draw AC=6 cm.Step II: With A as the centre and radius 6 cm, draw an arc.Step III : With C as the centre and radius 5 cm, draw an arc to intersect the arc drawn in Step II at D.Step IV: With D as the centre and radius 10 cm, draw an arc on the other side of the line segment AC.Step V :With C as the centre and radius 7.5 cm, draw an arc to intersect the arc drawn in Step IV at B.Step VI: Join BA, DA, BC and CD to obtained the required quadrilateral. Construct a quadrilateral ABCD, when AB = 3 cm, CD = 3 cm, DA = 7.5 cm, AC = 8 cm and BD = 4 cm. However, we know that the sum of the lengths of two sides of a triangle is always greater than the third side. Therefore, construction is not possible from the given data. Construct a quadrilateral ABCD given AD = 3.5 cm, BC = 2.5 cm, CD = 4.1 cm, AC = 7.3 cm and BD = 3.2 cm. Steps of construction:Step I: Draw CD=4.1 cm.Step II: With C as the centre and radius 7.3 cm, draw an arc.Step III : With D as the centre and radius 3.5 cm, draw an arc to intersect the arc drawn in Step II at A.Step IV: With D as the centre and radius 3.2 cm, draw an arc on the other side of AC.Step V :With C as the centre and radius 2.5 cm, draw an arc to intersect the arc drawn in Step IV at B.Step VI: Join BA, DA, BC and BD and AC to obtained the required quadrilateral. Construct a quadrilateral ABCD given AD = 5 cm, AB = 5.5 cm, BC = 2.5 cm, AC = 7.1 cm and BD = 8 cm. Steps of construction:Step I: Draw AB=5.5 cm.Step II: With A as the centre and radius 7.1 cm, draw an arc.Step III : With B as the centre and radius 2.5 cm, draw an arc to intersect the arc drawn in Step II at C.Step IV: With B as the centre and radius 8 cm, draw an arc.Step V :With A as the centre and radius 5 cm, draw an arc to intersect the arc drawn in Step IV at D.Step VI: Join DA, DB, BC, AC and CD to obtained the required quadrilateral. Construct a quadrilateral ABCD in which BC = 4 cm, CA = 5.6 cm, AD = 4.5 cm, CD = 5 cm and BD = 6.5 cm. Steps of construction:Step I: Draw BC=4 cm.Step II: With B as the centre and radius 6.5 cm, draw an arc.Step III : With C as the centre and radius 5 cm, draw an arc to intersect the arc drawn in Step II at D.Step IV: With C as the centre and radius 5.6 cm, draw an arc on the same side.Step V :With D as the centre and radius 4.5 cm, draw an arc to intersect the arc drawn in Step IV at A.Step VI: Join BA, AC, DA, BD and CD to obtained the required quadrilateral. Construct a quadrilateral ABCD in which AB = 3.8 cm, BC = 3.4 cm, CD = 4.5 cm, AD = 5 cm and ∠B = 80°. Steps of construction:Step I: Draw AB=3.8 cm.Step II: Construct ∠ABC=80°.Step III : With B as the centre and radius 3.4 cm, cut off BC=3.4 cm.Step IV: With C as the centre and radius 4.5 cm, draw an arc.Step V :With A as the centre and radius 5.3 cm, draw an arc to intersect the arc drawn in Step IV at D.Step VI: Join AD, BC and CD to obtained the required quadrilateral. Construct a quadrilateral ABCD, given that AB = 8 cm, BC = 8 cm, CD = 10 cm, AD = 10 cm and ∠A = 45°. Steps of Construction:Step I: Draw AB=8 cm.Step II: Construct ∠BAD=45°.Step III : With A as the centre and radius 10 cm, cut off AD=10 cm.Step IV: With D as the centre and radius 10 cm, draw an arc.Step V :With B as the centre and radius 8 cm, draw an arc to intersect the arc drawn in Step IV at C.Step VI: Join BC and CD to obtained the required quadrilateral. Construct a quadrilateral ABCD in which AB = 7.7 cm, BC = 6.8 cm, CD = 5.1 cm, AD = 3.6 cm and ∠C = 120°. Steps of construction:Step I: Draw DC=5.1 cm.Step II: Construct ∠DCB=120°.Step III : With C as the centre and radius 6.8 cm, cut off BC=6.8 cm.Step IV: With B as the centre and radius 7.7 cm, draw an arc.Step V :With D as the centre and radius 3.6 cm, draw an arc to intersect the arc drawn in Step IV at A.Step VI: Join AB and AD to obtained the required quadrilateral. 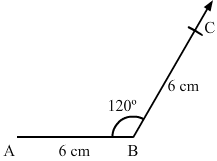 Construct a quadrilateral ABCD in which AB = BC = 3 cm, AD = CD = 5 cm, and ∠B = 120°. Steps of construction:Step I: Draw AB=3 cm.Step II: Construct ∠ABC=120°.Step III : With B as the centre and radius 3 cm, cut off BC=3 cm.Step IV: With C as the centre and radius 5 cm, draw an arc.Step V :With A as the centre and radius 5 cm, draw an arc to intersect the arc drawn in Step IV at D.Step VI: Join AD and CD to obtained the required quadrilateral. Construct a quadrilateral ABCD in which AB = 2.8 cm, BC = 3.1 cm, CD = 2.6 cm, and DA = 3.3 cm and ∠A = 60°. Steps of construction:Step I: Draw AB=2.8 cm.Step II: Construct ∠BAD=60°.Step III : With A as the centre and radius 3.3 cm, cut off AD=3.3 cm.Step IV: With D as the centre and radius 2.6 cm, draw an arc.Step V :With B as the centre and radius 3.1 cm, draw an arc to intersect the arc drawn in Step IV at C.Step VI: Join BC and CD to obtained the required quadrilateral. Construct a quadrilateral ABCD in which AB = BC = 6 cm, AD = DC = 4.5 cm and ∠B = 120°. Steps of construction:Step I: Draw AB=6 cm.Step II: Construct ∠ABC=120°.Step III : With B as the centre and radius 6 cm, cut off BC=6 cm.Now, we can see that AC is about 10.3 cm which is greater than AD+CD=4.5+4.5=9 cm.We know that sum of the lengths of two sides of triangle is always greater than the third side but here, the sum of AD and CD is less than AC.So, construction of the given quadrilateral is not possible.